If you are in search of both golf and life partner, you’ll be glad to know that more and more dating website are created every day to help you find one. 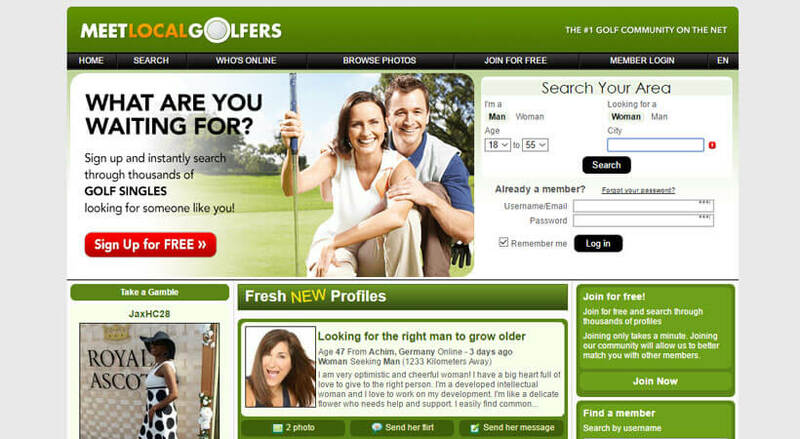 The Meet Local Golfers is one of the first dating communities we had a chance of exploring and it turned out to be one of the best golfer dating websites. Check out our Meet Local Golfers review below. This dating website made a very good first impression on us when we first started looking into it. Its color pallet of green and white reminds you of the golf court that you’re probably spending a lot of your free time on. Right there, on the home page you understand that this website has a lot to offer to its members and it shows. You can even find a small text at the bottom of the home page that says a bit about the website, as well as about what single golfers can expect on it, and sets high hopes for finding someone special in their golfing community. All in all, it is clear that a lot of effort has been put into the homepage, with the goal of attracting new members, and it seems to be successful judging by the number of new members that it gets each every day. The green-white color scheme continues throughout the website. It is very pleasant and not tiresome for your eyes. When it comes to the homepage, you can start you journey through this website right there, as you are immediately offered to check out some golfers near you. True, the page seems a tad crowded, so you can’t immediately decide what you want to do, but if you’ve come here to register, you’ll have no problem in finding this option. When signing up, you’ll quickly realize that you need but a few minutes to gain access to the ever-growing network of golf singles all over the world. After doing research for our Meet Local Golfers Review, we’ve come to conclude that the whole website is very easy to navigate. Another appealing perk is that you get to see snippets of the profiles that have been recently created, which gives you a fair idea of what you can expect in the community. Design is very straight forward, there’s no room for any lollygagging, which comes to show that here you will find golfers that are serious about getting to know someone special. As most good dating websites, Meet Local Golfers has a fair few features to offer, all in the light of making your mingling with other golfer singles easier. Dating websites are excellent for finding a match that shares you interests and hobbies, and this site is definitely one of them. What particularly caught our eye was the fact that while you’re creating your profile, you can actually come up with a witty headline that will then appear in the snippet of your profile. It’s an excellent opportunity to show your way of thinking and sense of humor in a couple of words. You can send flirts to the singles you’re interested in, and if they reciprocate you can message each other or even visit the chatroom, if you are in the mood for more direct face to face contact. Every member that catches your eye can be put in your little black book that enables you to see some special features of that person’s profile, which is an interesting perk. While writing this Meet Local Golfers review, we realized that not only members from the US, but from all over the world are welcome to join. This is very good news, because you get to connect with golf aficionados from all over the world without ever leaving your home. Even if you’re interested in simply sharing views about your golfer life, you can use chatrooms that are filled with members eager to do just the same. When you’re registering, you can set up the age span you’re interested when looking for a partner, which will help you find someone who is not only in your city or region, but is around your age as well. All kinds of profiles can be found on this dating website, all you should to is choose. Our Meet Local Golfers review mirrors the simplicity and ease with which you can browse through the Meet local golfers website, and if you are looking for a single golfer that is your match, this dating website is one of the best ones to start with. I was already a member of a bunch of different dating sites before I discovered Meet Local Golfers. I am an avid golfer myself so I thought, why not. I might meet a nice lady who’s into golfing so we can share our hobby and our passion. Excelent website for meeting local chicks who’re into golfing. Very good service, works fine, plenty of people on it. I am very happy with meetlocalgolfers.com. I check it out on a daily basis, to see if I have any new messages, flirts or anything. I already have lots of ladies on my favorites list, and I’m hoping to meet some of them in person soon. I love the chat room, it’s always fun and full of people. I would recommend this website to anyone who loves golfing and wants to talk about it with others who are just as into this sport as I am. great website, I recommend it to all my friends. I don’t golf but I like to meet girls who are into golfing because it’s a great sport and I would like to learn more about it.